We got a Taxi early morning from the Jungle Hostel heading to Panjim, which is the state capital of Goa, where we were spending the night before getting the train to Mumbai the following day. 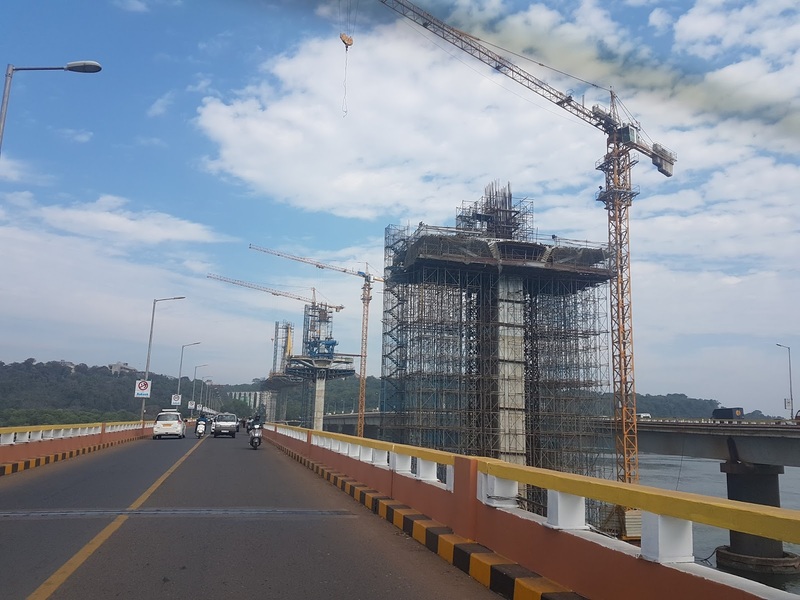 Just as we entered the city, there was a huge construction project going on to build a new bridge over the Mandovi River. 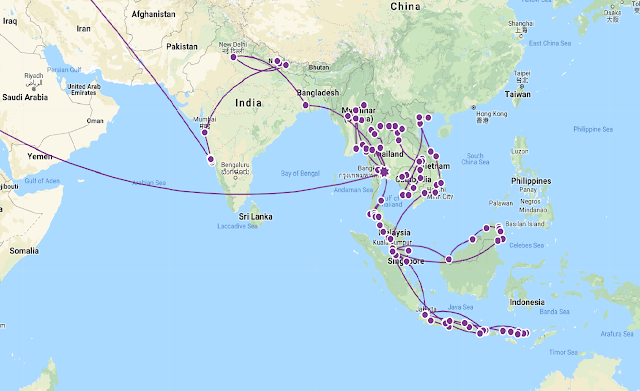 What caught my attention to this, was that the construction method and design of this bridge was pretty much the exact same as the new Queensferry Crossing going over the Firth of Forth in Scotland. As well as carrying a chest infection for the past few days, I was now also suffering a bad back, which I think has been caused by all my coughing, plus an uncomfortable bed at the hostel. 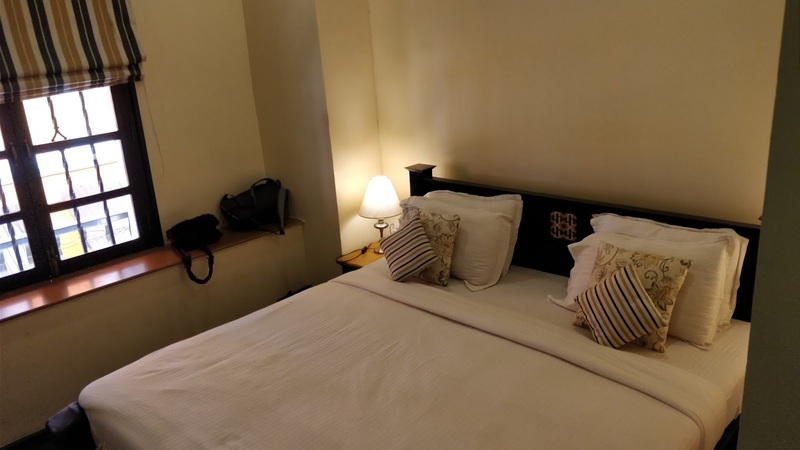 Thankfully we had booked a little bit of luxury for our last night in Goa, staying in a lovely hotel called La Maison Fonthainhas. What a difference in the bed/pillows we had, just wish we were staying more than the 1 night! 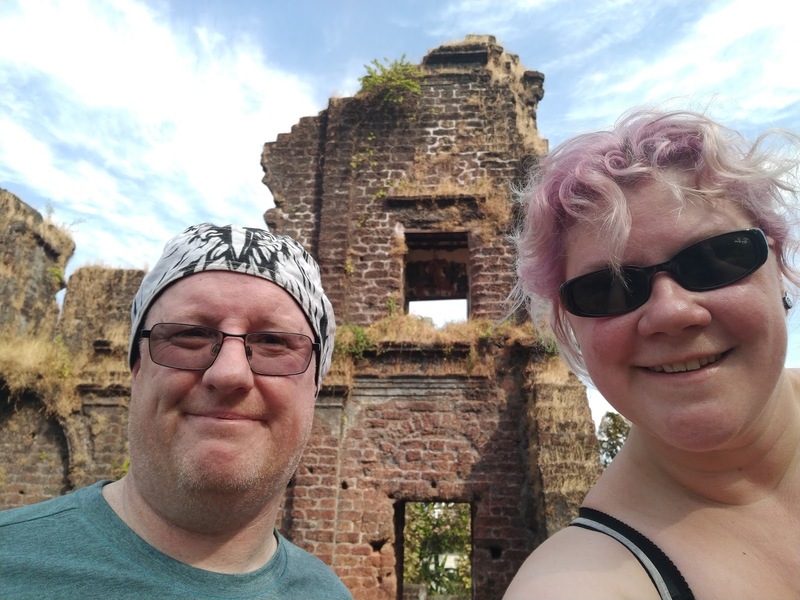 So, with having all afternoon to explore the area, Sadie really wanted to visit Old Goa, and after a quick Google, the cheapest way to get there was via local bus. After heading down to the bus station and asking a local, we were quickly ushered onto what can only be described as ‘how many can you fit on’ bus, and off we went. 10 rupees, some Hindi Happy Birthday songs and 30 minutes later, we got off in the heat of the mid-day sun. We went around the Basilica of Bom Jesus, St Augustine Tower and the Archaeological Museum before the heat got a bit too much for us, so got a less crowded bus back to the hotel to freshen up. We both got dressed up for the first time on this adventure, as we were eating in the restaurant attached to the hotel called Desbue. This was a bit of fine dining experience and the food did not disappoint, with Sadie having a Seafood brisque and Braised duck and I had Baked mussels and BBQ Ribs along with several beers and some red wine… however dessert would have been a course too far and not to mention the most expensive meal so far too. Heading into town for a few drinks after dinner, we ended up at a bar called Café Mojo Pub & Bistro, which from what I had read and from first impressions inside, looked a decent choice… oh how wrong that was! We were met by a hostess, who explained to us we had to buy a card for 500 rupees which you then could spend on drinks. However, the price of the gin & tonic we wanted used 300 of that, which in comparison to other places in Goa, was expensive. This pub also had a e-serve system for beer, which there was a pump at the table and you could self-pour the local Kingfisher, so we got a couple of glasses and went to have a beer. 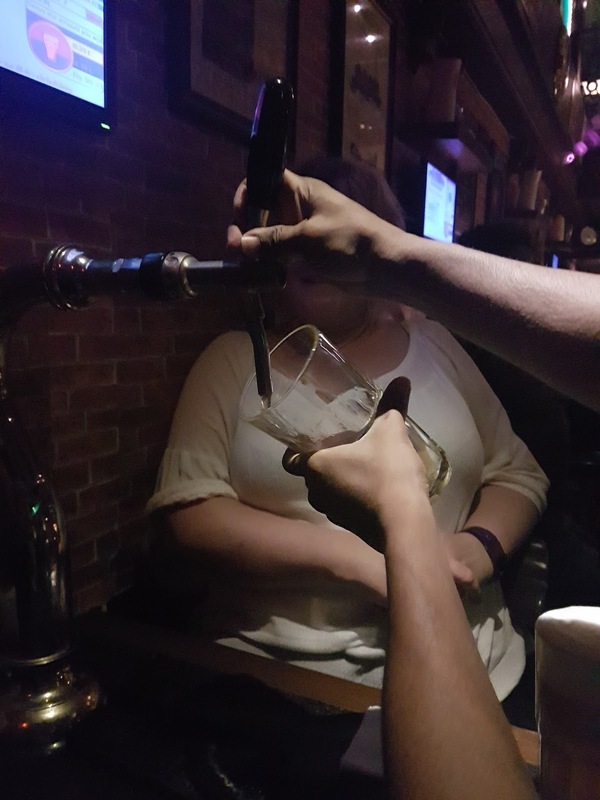 The tap wasn’t working properly, so one of the bar staff came over to try it, and wasted some trying to get what looked to be 2 pints… except it was cloudy, flat and disgusting too! 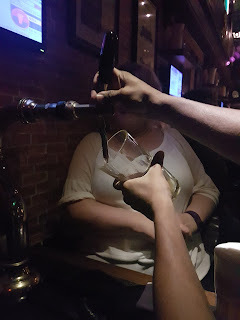 We informed the bar staff, and they just seemed to not be interested in sorting it and it wasn’t until I had to go to the bar to speak to them, they changed the 2 pints for bottles. We quickly drank them and left to head back to the hotel. Next to the hotel was a little bar we noticed earlier called Viva Panjim, so stopped here for a quick drink before bed. 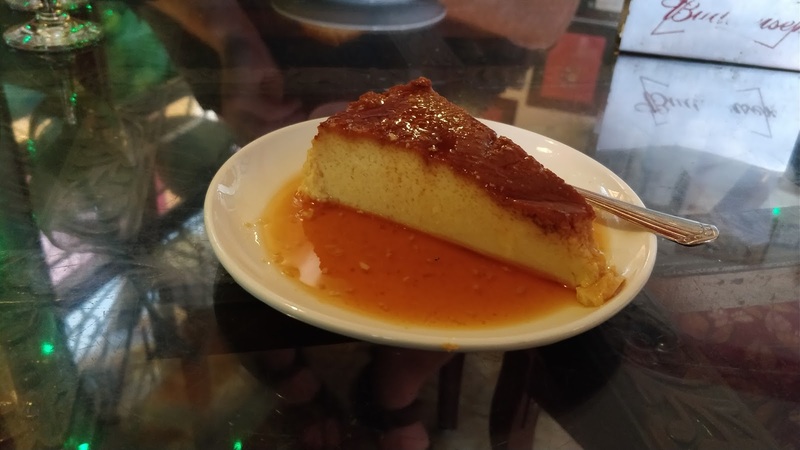 Now having room for dessert, Sadie ordered a Crème Caramel which was only one of the best she has ever eaten, including those in France!